I read an article a few minutes ago, about an Iranian Pastor who has been in prison for standing his ground in what he believes, this post has rattled me like you cannot believe, I sit here and it feels like my heart has been ripped out as if it were someone in my family that this has happened to. I tried to reblog the post but for some reason it did not work, in this post was a link I went to read the story of this Pastor, and have just copied and pasted it as it was stated there. I will also provide you with a few more links of other sites regarding to this Pastor. He has been sentenced to death and yet he still stands strong for Jesus, how many of us have been put in such a situation where you either renounce your faith and belief in the Almighty God or you die, not many I am sure, it ust be very hard for him, but I admire his commitment. I pray that God make a way for him and that he be released and to continue spreading the word of God. We first reported the arrest of pastor Youcef in the fall of 2009. If you’d like to assist us in our work for the persecuted church you can do so here. 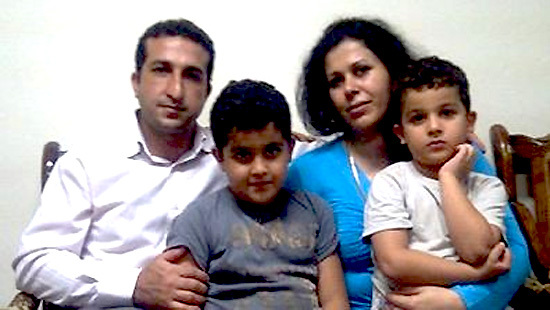 Here is a brief history of Youcef Nadarkhani, leading up to his current situation. **UPDATE** – Youcef is still under the death sentence for apostasy. In June the Supreme Court upheld the death sentence as it is based upon fatwas of the Supreme Leader. On September 25-28 hearings were held by the Gilan provincial court to determine if he was a Muslim. On the 26th they determined that Youcef was a Muslim because his parents were when he was born. All witnesses stated that he did not practice Islam, yet the court inexplicably determined he was a national apostate. At each hearing he was commanded to recant and each time he refused. Two hearings were held after the verbal determination was made by the judges. There is a serious concern that he could be executed at any time because according to Sharia Law you are to be given three days to recant if you are an apostate. He was commanded to recant three straight days after the judges made their determination. The attorney’s for pastor Youcef are stating that, by law, the written verdict must be delivered within seven days. To this date the written verdict for Pastor Youcef has not been delivered. The court has promised another delay for the express purpose to give him more time to recant and return to Islam. Youcef is 34 years old and is from Rasht, in the Gilan province of Iran. For the past ten years he has been a pastor in a network of house churches. He was previously imprisoned in December of 2006, the charges being apostasy (leaving Islam for Christianity) and evangelism (spreading the message of the Gospel of Jesus Christ), but was released two weeks later. He is married and has two sons, Daniel age 9 and Yoel age 7. They were attending a local school when the government decided that all children should be taught about Islam, including those from Christian families. Youcef went to the school and protested this based on the Iranian constitution, which allows for freedom to practice religion. As a result, the secret police called him before the political tribunal in Rasht, Iran on October 12, 2009. At that time he was arrested, charged for protesting, and has been in prison in Lakan (which is seven miles south of Rasht) ever since. Later the charges changed to apostasy and evangelism to Muslims. Youcef is imprisoned in the Lakan prison, a city close to Rasht. Over the time of his incarceration he has mostly has had access to an attorney, and has been allowed visits from his wife, children, and friends. However, for the first month in prison and for several months around the time of his trial he was in solitary confinement. They have used various methods to try to convert him back to Islam, including giving him pills, apparently in an attempt to claim that he was insane. Because Youcef’s faith remained strong, they decided to arrest his wife in order to place more pressure on him. On June 18th, 2010 Fatemah Pasindedih was arrested, charged with apostasy and placed in prison in Lakan. During this time their boys went to live with a relative. Both Youcef and his wife Fatemah were threatened by authorities that their children would be taken away and given to a Muslim family. Youcef was not swayed to turn back to Islam, so his wife was put on trial without an attorney, and sentenced to life in prison. An attorney was later hired and the sentence appealed. The sentence and conviction were overturned and she was released. On September 21 and 22, 2010, Youcef was put on trial, and verbally given the sentence of death. A written verdict was delayed and then delivered, on November 13, 2010, by the 1st Court of the Revolutionary Tribunal. He is to be executed by hanging for the crime of apostasy. Twenty days are allowed to appeal the sentence with the Supreme Court of Iran. On December 5, 2010 the verdict was appealed to the Supreme Court, but on June 28, 2011 we learned that the Supreme Court reached a decision. The third chamber of the Supreme Court in Qom upheld his conviction for apostasy and the death sentence. They have commanded the local court to re-examine whether or not he was a practicing Muslim from ages 15 to 19. If it is determined he was a practicing Muslim he will be given another chance to recant and then he will be executed. Based upon Islamic Sharia Law an apostate is to be given three days to recant. There is a very real concern that he could be executed at any time. The attorney’s suggest that first a written verdict will be delivered, by law within a week, and secondly they will have the opportunity to appeal the verdict. Nonetheless, there are no assurances that he will not be executed. It could happen at any time. This is the way that the Iranian government operates with executions. They do not give advance notice and it is done in secret. We cannot wait another moment, we have to contact our elected officials. We need to fast and pray for his deliverance. Contact the international news media, international human rights organizations and the government. Go to http://presenttruthmn.com/persecuted-christians/ to get more details on how to contact someone. My heart goes out to this man, if I could get on a plane right now and help him I would but I cannot, there is nothing in this world that is more powerful than PRAYER, Please friends lets all pray for this man.